There is more than meets the eye in Israel's ceasefire agreement. 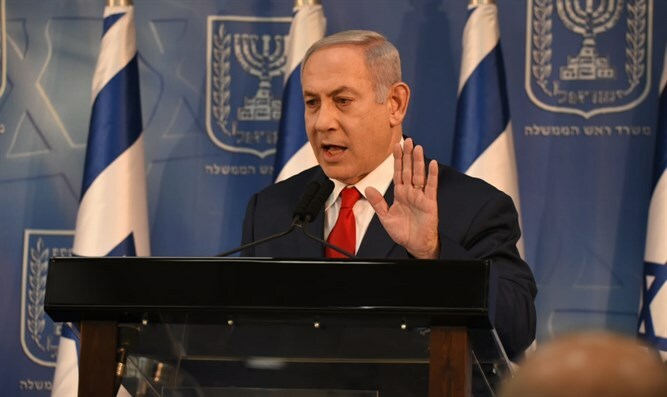 On Sunday evening, in an effort to save his coalition, Israeli Prime Minister Benyamin Netanyahu addressed the Israeli public during a nine minute televised speech at the IDF Headquarters in Tel Aviv. After recapping his own history as a member of the IDF elite unit Sayeret Matkal, the death of his brother Yoni who died in 1976 during the famous Entebbe raid in Uganda, and his injuries during several battles, Netanyahu said he had endangered his life time after time and as Prime Minister gave the orders for “countless actions” to ensure the security of the State of Israel. He then said Israel was in “one of the most complex situations” in its history and claimed in this situation there was “no room for politics” while he went on to mention the multiple times he had to take “very difficult decisions” to ensure the safety of Israel’s citizens. As the new Israeli Defense Minister - Netanyahu refused to give in to the demands of Bayit Hayehudi leader Naftali Bennett to appoint him as the new DM - he acknowledged there had been severe criticism on the way he had handled the mini-war with Hamas a week ago. There was, however, no way ordinary citizens or even politicians could judge the complex security situation in Israel at this time, Netanyahu explained. He said only the top IDF echelons and the intelligence services in Israel and he as the Prime Minister had a full view of Israel’s security situation and that the public only saw “a partial picture” while he and the security services were in the “midst of wide operations” which were meant to restore full security to the Israeli public. It was the second time in one week the Israeli PM made remarks about the complexity of Israel’s security situation and the inability of citizens including politicians to see the overall picture of the country’s security situation. Last week Netanyahu said that as leader of Israel he sometimes had “to hide crucial considerations that must be concealed from the enemy” and hinted that there were plans for an operation in the future. "I cannot elaborate on our plans for the future but we will determine the right conditions and the right times for the State of Israel, those which are optimal for the security of our citizens,” the embattled PM told participants in a state memorial service commemorating the 45th anniversary of the passing away of former Israeli PM David Ben Gurion. Many understood this as a hint he would give an order to invade Gaza the next time Hamas breached the current ceasefire. However, Netanyahu, during his address to the nation, hinted a future IDF operation would be something much larger than a new incursion in Gaza and said it would demand “sacrifice”. On Monday morning, while briefing the Knesset Committee for Foreign Affairs and Defense, the Prime Minister and DM made clear his focus is still on Israel’s northern front and Iran’s entrenchment in Syria where Israel’s operational freedom has been limited by the delivery of the Russian S-300 anti-aircraft shield to the regime of dictator Bashar al-Assad. Netanyahu said Israeli “spy-planes continue to fly and collect information” all the time and he also revealed he had requested Russian President Vladimir Putin’s help to get Iran out of Syria. Getting the Iranians out of Syria would require the help of a third country according to the Israeli leader and his remarks immediately led to speculation Israel could be that third country. The Israeli PM is very concerned about the developments on the northern front where Iran is working in tandem with Hezbollah to turn the 140,000 rockets of the Lebanese terror organization into precision missiles and where the Iranian Revolutionary Guard Corps (IRGC) has established the so-called Golan Liberation Brigade in Syria, an umbrella organization of Shiite Militia which reportedly has 80,000 fighters at its disposal currently. The Syrian regime last week threatened to launch a war against Israel over the Golan Heights during a meeting of the General Assembly of the United Nations. This could be a first attempt by the Iranian dominated pro-Assad coalition to find a casus belli for war against Israel now that the civil war in Syria is slowly winding down. The IDF and the Netanyahu are getting more and more convinced Iran will open up a three-front (missile) war in the future via its proxies in Lebanon, Syria and Gaza while there seems to be serious doubt the IDF is currently ready for such a war. Last week’s mini-war with Hamas and Islamic Jihad, both supported by Iran, was most likely an Iranian trap to tie the hands of the Israeli military to Gaza and could have been a first attempt to open this three-front-war. The opening attack which preceded the missile onslaught was taken out of Hezbollah’s playbook for wars as a report by The Meir Amit Intelligence and Terrorism Information Center made clear on Monday. The Kornet anti-tank missile Hamas used to hit a bus which had just transferred 50 IDF soldiers to the border with Gaza was supplied by Hezbollah and made in Iran, while the attack itself bore all the hallmarks of a Hezbollah operation. Islamic Jihad, furthermore, revealed it had used a new rocket with a large warhead to inflict more damage in Israel during the 25-hour-missile attacks on cities and communities in southern Israel. The missile was a copy of the Iranian Falaq-2 rocket, a short-range missile with a large payload which can destroy large military installations. This was the projectile which destroyed a building in Ashkelon, the largest Israeli city in the vicinity of Gaza. Another indication Iran ordered the dramatic escalation in southern Israel was the way the Palestinian terror groups operated during the one-day war. The wide-scale attacks which were conducted in waves indicated the Iranian proxies in Gaza wanted to test the reliability of the Iron Dome anti-missile shield and intended to draw the IDF into a new ground offensive. A similar strategy was used by the Israeli military on the night of May 10th when Iran attacked Israel’s north with more than 30 missiles from Syrian soil. That attack was provoked by the Israeli Air Force (IAF) which repeatedly bombed Iranian weapon deliveries to Hezbollah in Syria and the Iranian reaction gave the IAF the legal opportunity to take out most of the Syrian air defense systems and to destroy Iranian bases and missile batteries in the country.